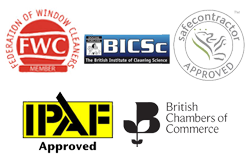 Window Cleaning | Ashford Cleaning Contractors Ltd.
We provide professional window cleaning services to a huge number of very prestigious clients in and around the Ashford Area. We now provide all high level window cleaning services using our ‘Pure Water-Fed Pole Reach and Wash System’. We are also fully insured to carry out ladder work and high access machine work when required. The advanced window cleaning system we use enables us to carry out window cleaning work at up to 60 feet without the need for ladders or access equipment. This eliminates all risks under the recent changes to Health and Safety Working at Height Regulations.